You will be given a Free reference e-book to read which has 625 pages And the test will be based on that e-book. Server + refers to one of the most useful computer programs in the IT industry which is useful in providing great services to other PC programs and users using similar computer or other computers. It can also be defined as the computer wherein a server program is frequently operated. It also refers to the specific program which works by waiting and fulfilling the requests of programs designed for clients operated on a single or multiple computers. An application is provided which serves as the client and works by requesting for services from various programs. When linked to the web, server + can be defined as a program which is housed within a computer and works by serving all HTML files and pages that are being requested. It requires web clients since they will be the ones who will request programs linked to the user. A good example is your PC’s web browser since it serves as a client requesting for HTML files from various web servers. If maximizing the level of your knowledge about server + is included in your major objectives, then note that you can now easily achieve this aim with the help of Brainmeasures which boasts of its highly impressive server + practice course offered for free. This course is complete with all the necessary elements and components that you need to conveniently pass the server + certification course including the free practice test and study guide. Passing the server + certification has never been easier without Brainmeasures around. This legitimate and impressive online certification company takes pride with all the free practice courses that it now offers including the server + practice course. It boasts of a detailed study guide that talks about the different types of servers, its major functions and how they work. A free server + practice test is also included in the course. This free practice test was professionally developed by real experts so you have a guarantee that it really works in improving your skills and ability to pass the actual server + certification exam. With all the inclusions in this free practice course, becoming a certified server + expert will no longer become a problem. How to verify power on using the power-on sequence? 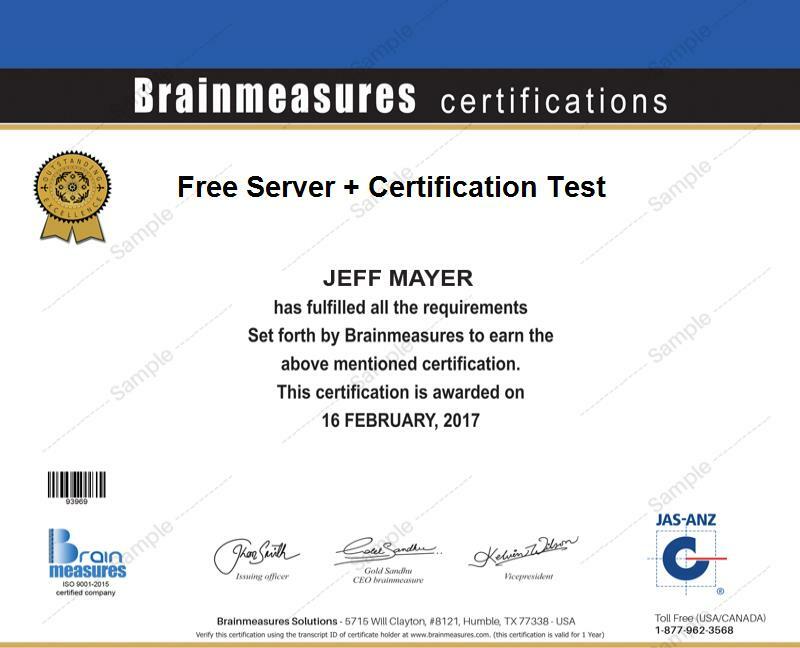 Taking up the free server + practice course offered by Brainmeasures is definitely your ticket towards passing the server + certification exam. This practice course is intended for all those who desire to receive the certification including software and server developers, server administrators, automated server technicians and systems and server engineers. Holding a server + certification also boosts your chances of earning higher in this industry. Your certificate can help increase your chances of working as a server administrator and raise your salary within the range of $62,000 to $104,000 yearly. Your certificate is also extremely useful especially if you plan to work as a server engineer since it lets you receive up to $145,000 every year.